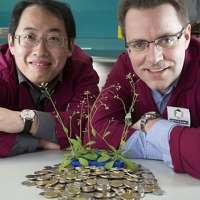 Energy is an all-important currency for plants, and scientists from The University of Western Australia have now calculated the cost of one of their biggest expenses. The knowledge could be a key to creating more energy efficient crops. To grow and maintain themselves plants must constantly create new proteins and break down existing ones. The process, called 'protein turnover', uses much of a plant's energy. Armed with a new technique, researchers have determined exactly how much a plant needs to spend on specific proteins. The knowledge can be used to help plants become better energy spenders. Dr Lei Li, lead researcher on the study from the ARC Centre of Excellence in Plant Energy Biology at UWA said this means they can now measure how long a plant protein lives and how much energy a plant need to spend in order to keep that protein around and functional. "We've calculated the lifespan of over a thousand proteins and, importantly, the energy investment needed by a plant to maintain each of them," Dr Li said. "Essentially we've figured out the cost, to a plant, of each protein". The researchers found that the half-lives of the proteins studied can vary from several hours to several months. This led them to investigate the specific characteristics which determine how quickly a protein is turned over, and how much energy is needed to do it. The comprehensive study also revealed the features that allow a protein survive longer. This knowledge could be applied to help plants engineer more robust, less energy expensive proteins. Co-researcher Professor Harvey Millar said it's much like spending money on a product you need. "The best option is to balance between whatever will last you the longest, but cost you the least," Professor Millar said. "If we can teach plants how to more wisely use their energy budget to meet requirements and to face environmental challenges then the result will be more energy efficient and productive plants. "This is particularly valuable for agriculture, where current crop plants are not going to be able to meet future food requirements. "In a world faced with increasing populations and limited land for agriculture, more energy efficient plants are necessary to feed us into the future." The study was published this week in the journal The Plant Cell.